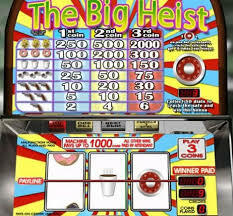 A very good and innovative slots game is The Big Heist Slots. It was devised and released by the famous creators of online slots game – RTG. The machine in the game is classic, as it has 3 reels and only one payline. However the actual type of the game itself is a bonus, progressive classic slots game. There isn’t any big jackpot in the game, rather there is a progressive max jackpot. There is a second jackpot, however, which is of the very good amount of 500 coins. The coins have sizes varying from $0.05 to $5.00 and you can bet up to 3 coins, which makes the max amount of coins you can bet of $15.00. The winning combinations in the game are 7, and as the game has 3 reels and one payline, I would say this gives you a pretty good chance of winning. The theme of the game is “crack the safe”, or heist. The symbols are a badge, a doughnut, a gun, a safe dial and sunglasses. There aren’t any wild or scatter symbols in the game. There is a bonus game on the reels though, which is Crack the Safe Bonus Round. There is also a coin based game.